Pesto is such a wonderful ingredient to use during the summer when basil grows so abundantly. Creative uses for pesto include spreading it onto pizza dough, mixing into ground beef for burger patties, using as a marinade for grilled chicken or fish, stirring into melted butter for grilled corn, or combining with ricotta for a delicious dip for outdoor entertaining. Join in on the pesto celebration by instagramming, tweeting, or posting photos of the multitude of ways pesto brightens recipes using the #SummerofPesto hashtag for a chance to win an assortment of pesto-themed prizes from my friends at Giovanni Rana! Giovanni Rana has been a renowned pasta maker in Italy for over 50 years. In 2012, the Rana family launched its first state-of-the-art factory in the US (just outside of Chicago in Bartlett, IL), which produces the retail line of pasta and sauces now distributed all over the country. The factory is home to proprietary machinery designed by Giovanni that mimics the movements used to hand-roll dough to produce an exceptionally thin pasta with a delicate bite. The fillings are created from artisanal ingredients including D.O.P. Parmigiano Reggiano cheese imported by the wheel and D.O.P. Genovese basil. Prepare tortellini according to package instructions. Cool in well salted ice water. Drain well until almost dry. 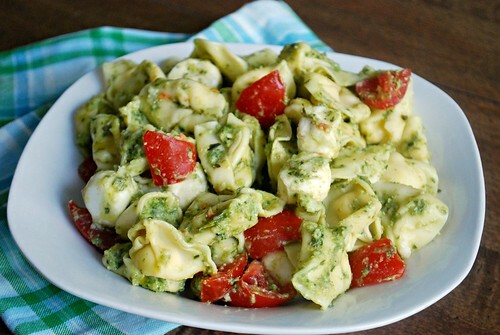 Whisk together basil pesto and water and toss gently with tortellini. Add fresh mozzarella and cherry tomatoes and gently fold to incorporate. Top with fresh basil and Parmigiano Reggiano.